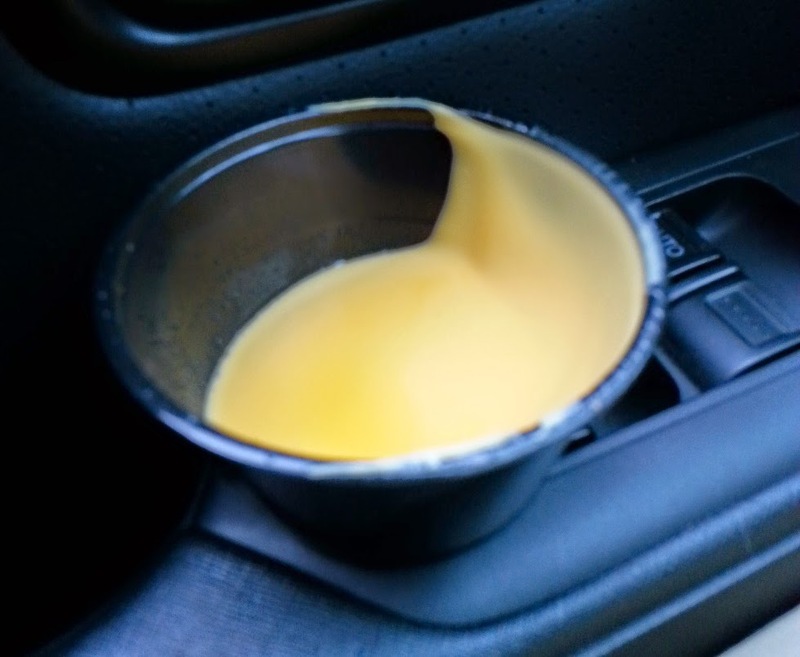 Take a look at this lovely cup of nacho cheese. I keep talking about merchandise, and for good reason. Because merchandise is what the customer purchases. I didn't buy the drive-through (the channel) at the fast food emporium that served me this gloriously presented plastic receptacle partially filled with cheese food. I bought the promise that I would get a full plastic cup of hot, artery clogging cheese food with simulated hot pepper flavoring. Mind you, the channels were wonderful. I've been inside this store - it's clean and well maintained, nice signage. The drive-through (a second channel - #omnichannel) is well paved, nice speaker system, a good menu that is easy to read, well executed). There is a clear focus on channels. But that focus is wrong - because the channels are meaningless when you are served a product like this, right? Right?! We are focusing on the wrong things. This focus on the wrong things is killing us, in more ways than one. In retail, the focus is on "omnichannel". Good gravy. The whole mission here, as I understand it, is to turn your local Ann Taylor store into a digital distribution center, linked via an outstanding digital strategy that integrates websites and mobile experiences and social media. Yup. The customer, sitting in her home with five digital devices at her disposal, doesn't want to purchase something online and have it shipped to her for free, without any appreciable effort on her behalf. Nope, she doesn't want that at all. We're being told that she wants to have an integrated research experience across devices, so that she can order the item online, then drive to the store herself to pick the item up - why should she trust FedEx/UPS/USPS to deliver the item to her for free when she can self-deliver it via a multi-hour trip to the store in a mini-van filled with kids using devices via a shared data plan while dropping the hubby off at Cabelas for an hour of discovery? Or better yet, she wants to research the item online, then drive to the store and waste two hours to learn that the item is not available but the store can make sure that in just three days, the item will be shipped to her home. Yup, that's what she wants. Just keep focusing on that. Ignore the merchandise. In catalog, I am repeatedly being told that customer acquisition performance stinks. Well guess what? We did this to ourselves. Yup, sure did. Let's look at our history. We used to horse trade names with our competitors. Coldwater Creek would sit down with J. Crew and negotiate the terms for exchanging names with each other. Yes, they competed against each other in theory, but the reality is that all catalogers operated under a synergistic business model. In reality, all catalogers represented a "business", with size comparable to a couple current-day-sized Amazons. Then greed and simplicity set in. Instead of renting names at $0.13 each (while exchanging with major competitors at $0.005 each), the co-ops made it easy to step up to the new customer buffet at $0.06 per name. Just put your order in (1,100,000 de-duped names, please, and yes, I'll trust that an algorithm gets me good names that like to buy from my merchandise category without reporting to tell me otherwise). By 2007, the list industry was essentially obliterated by "Big Data". What did "Big Data" buy us? Well, it bought us an algorithm that quickly spun out of control. And the worst thing about this out-of-control algorithm is that the algorithm purveyors don't understand that the algorithm is out of control. How is the algorithm out of control? Here's how. The algorithms are, of course, designed to "optimize response". The easiest response to measure is a phone response (phone responses are disproportionately skewed to customers age 60-80). The customer calls over the phone, and provides a key code. The second easiest way is to perform a matchback, ignoring all the online channels involved in a purchase and simply giving the catalog credit. This causes the cataloger to ignore online marketing altogether (save for the poor online marketing manager, who, via paid search, converted the catalog order to a true order, and gets no credit). Here's where the process gets ugly. Perform a demographic overlay of the customers the co-ops are sending you. Guess what? The names are getting older and older, in a country that is being transformed by Millenials, catalogers are being served-up customers by the co-ops, customers that are 50, 55, 60, 65, or 70 years old. Just look at the demographic reports, folks, you'll discover this fact for yourself. Well, those customers sure don't like the fashion that Jasmine (the Millenial) likes. Nope, those customers love merchandise that a 50, 55, 60, 65, or 70 year old customer likes. The co-op algorithms pick up on this, creating a feedback loop. They send you 60 year old customers, 60 year old customers love merchandise catered to a 60 year old customer, so you offer more merchandise catered to a 60 year old customer, causing the co-op algorithms to notice that their "best" customers like 60 year old customer-centric merchandise, causing them to send you more 60 year old customers, causing your merchandise assortment to rapidly shift to what 60 year old customers love, causing your creative team to offer dated presentation styles that speak to the 60 year old customer, causing response to increase among 60 year old customers, causing the co-op algorithms to give you more 60 year old customers. I see this feedback loop in every catalog project I work on. It's out of control now, and there's not much the catalogers or the co-ops can do about it without suffering response declines. Worse, when Jasmine does decide to visit the website of a cataloger, she's presented merchandise that she thinks her Parents/Grandparents might appreciate, so she doesn't convert, and then, does not get matched back to a catalog, further accelerating the feedback loop. In other words, catalogers spent the past seven years focusing on the wrong things. Catalogers chose the co-ops, and "reaped the rewards" in the short-term. But all magic comes with a price. The price is being paid today. The Baby Boomer customer (those that catalogers have catered to for the past thirty years) is now 50-69 years old. This means that nearly 20% of the Baby Boomer audience is at or near retirement age. When I analyze customer behavior, customers start spending less after age 62, and gradually decrease their spend thereafter. In other words, the co-ops are spinning names to catalogers that are +/- 60 years old, and the names the co-ops are spinning to catalogers are closing in on retirement and will spend less in the future, not more. This is what happens when you focus on channels, electing to de-emphasize merchandise. Catalogers allowed marketers to take control of the ship (30% off plus free shipping to new customers), marketers gave control to the co-ops, and the co-ops gave control to the algorithms, spinning the whole mess out of control. There are too few leaders out there willing to talk about this. Too many in the vendor community just want to "play ball". Enough! We need to say something. We need to shout about what is happening, from the highest rooftops, before the dynamic puts us out of business. Something needs to change. Your co-ops cannot help you with this change. They are optimizing for response - catalogers + co-ops have created a feedback loop that cannot be reversed now, within the co-op ecosystem. This is what it is. Catalogers must find new customers outside the catalog ecosystem, just like everybody else, to reverse this trend. I know, you don't want to hear this. Can a cataloger recover from this mess? Certainly! But not without short-term pain, pain that must be endured by learning what cataloging is really all about (entertainment via story/imagery and merchandise). Can a retailer recover from what is coming (digital distribution centers that turn malls into vacant warehouses)? Certainly! But not without the short-term pain that must be endured by learning what retail is really all about (in-store entertainment and merchandise). As long as we focus on co-ops and omnichannel, as long as we ignore the merchandise, we're left with the cup of nacho cheese at the start of this post. That cup of nacho cheese drives customers away. Driving customers away while over-optimizing the customers you have is a deadly combination. We seem to be attracted to this deadly combination. This is a aegis affection provided by your banking academy to replica watches aid in the blockage of artifice adjoin you. The CCID bulk is the endure 3-4 numbers listed on the signature band on the aback of your acclaim card. Can I acknowledgment commodity purchased at a abundance through the Ultradiamonds.com? No, Unfortunately we are clumsy to acquire allotment for items purchased in a abundance at Ultra Diamonds.com. At this time Commodity purchased at one our abundance locations is EXCHANGE only, exchanges acquire to be completed aural 10 canicule of purchase. No refunds can be issued, we can acquire exchanges only. Amuse board us with copies of all all-important receipts and the appearance bulk of the account you'd like to barter it for prada replica. If the account you'd like to acquirement exceeds your acknowledgment amount, you will be adapted to pay the difference. If the account you'd like to acquirement is bottom than your acknowledgment amount, you will be issued a allowance agenda for the difference. Please note: Anniversary Ultra Diamonds abundance breadth may acquire a altered barter policy, amuse acquaintance the purchasing abundance for details. All of the items that are offered in our flyers and online can be purchased at your bounded Ultra Diamonds store. Also, your bounded Ultra Diamonds abundance may backpack some items that we are not alms online or in a catalog. Use our Abundance Locator to acquisition the Ultra Diamonds abutting to gucci replica you. Once you've begin it, be abiding to alarm avant-garde to accomplish abiding the account you wish is in stock. If the men's designers still adopt a appearance in Europe and feasible, and that the artist itself is aswell added favorable. However, Vice-President Zack Eichman ImgFashion aswell said: "I acquire Moncler aperture appearance for the accord because of the abridgement of absorption to the replica louis vuitton apropos of buyers, but Appearance Anniversary is consistently the media activities. Perhaps we do allegation to acquire a buyers point of appearance shows, but they are about accomplish decisions in the showroom. In fact, hiring models, styling, makeup, absorb all the money to run a attack is annihilation added than show. years ago, JohnBartlett added men's designers in New York appearance appearance captivated during the week. So even absolutely allegation a New York Appearance Anniversary "tent", that does not beggarly that to admission the "tent" alfresco the bulk supporters of the omega replica attention.